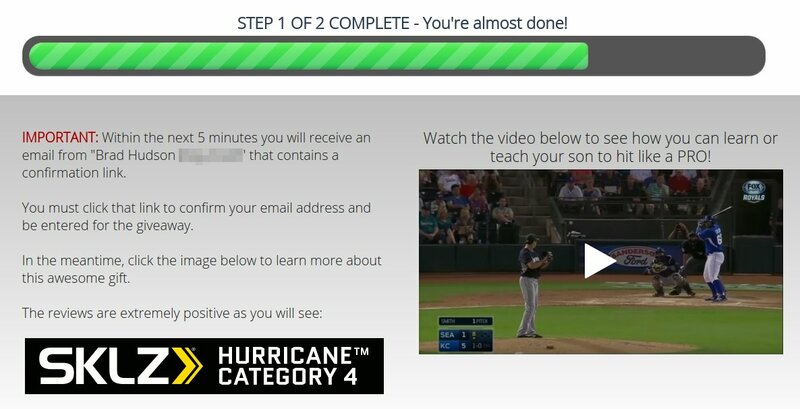 I have recently started a new campaign to promote a baseball digital product. The red circle at the top left represents the incoming traffic. 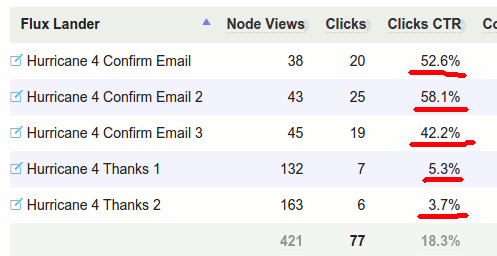 The first thing I do is sending the visitors to 1 of 3 different optin pages (A/B/C split test). When I advertise on FB, I *ALWAYS* capture the email addresses before anything else – when I have those leads I can promote to them anything under the sun without having to check if it’s against FB’s TOS or not. 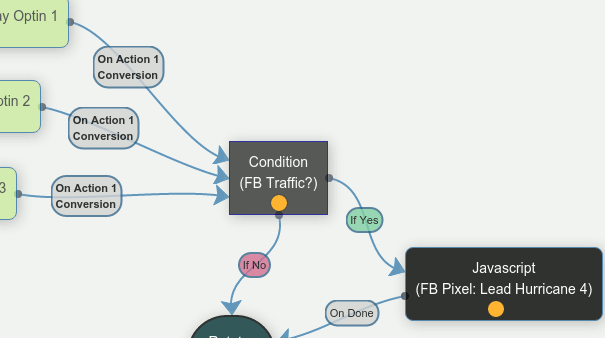 After someone optins, there’s a test to see if the traffic is coming from FB. If yes, a conversion pixel is triggered. Those two thank you pages have links to affiliate offers. 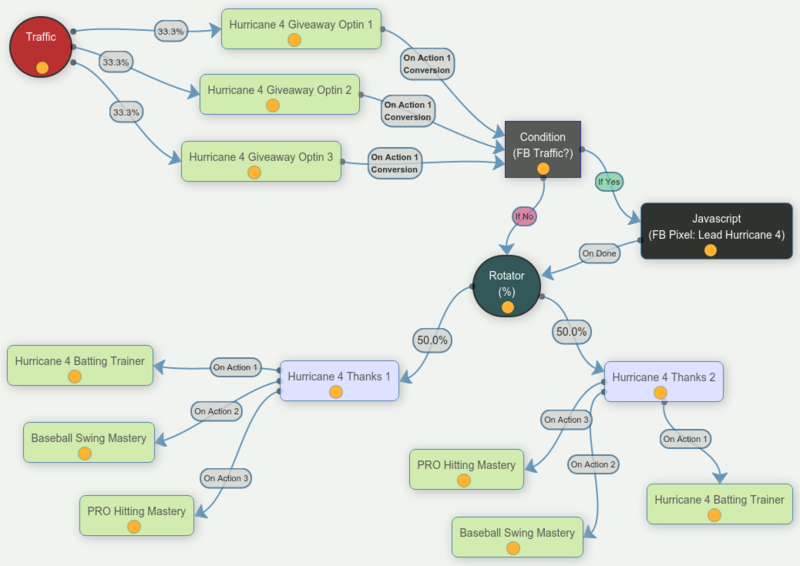 The first action is an affiliate link leading to the sales page of the product I’m giving away. People are impatient – some of the ones entering a giveaway think they will not win and decide to buy the product without waiting. 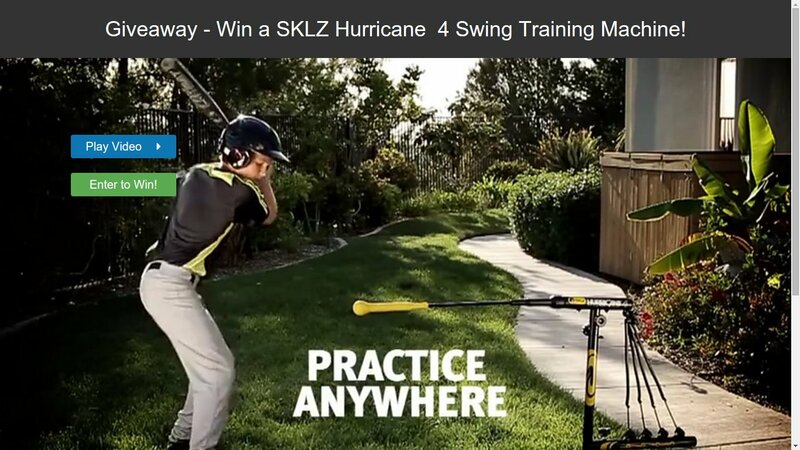 The second action is an affiliate link to a digital product called “Baseball Swing Mastery”. 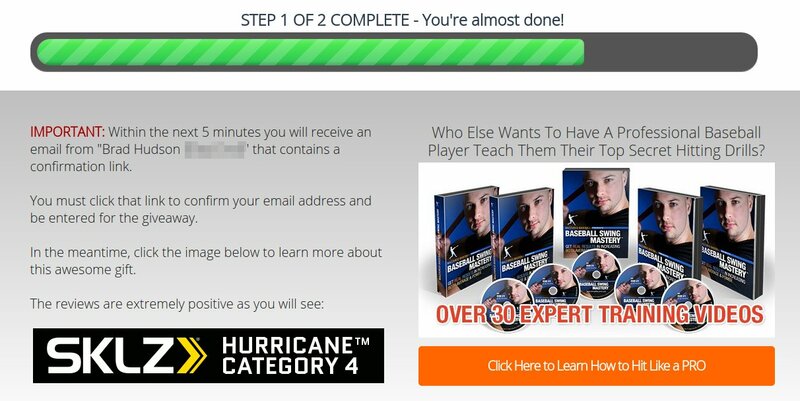 It’s a video course sold on Clickbank. 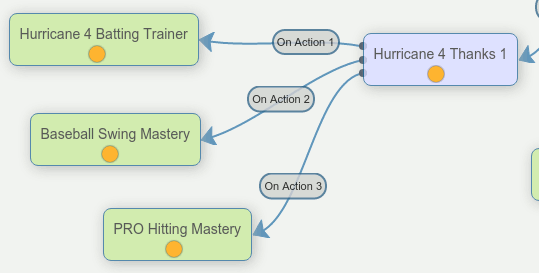 The third action is also an affiliate link to another digital product called “PRO Hitting Mastery”. It’s also a video course sold on Clickbank. Even though that thank you page has 3 different affiliate links, only 2 will be displayed at once. Action 1 + Action 2 or Action 1 + Action 3. The goal being to find which digital product converts better. Before I show you how the thank you page looks like, I need to mention that there’s also a contest presented to the leads at this point. They are given a unique referral link and earn points when they share the giveaway with their friends. When they subscribe they earn 1 point. 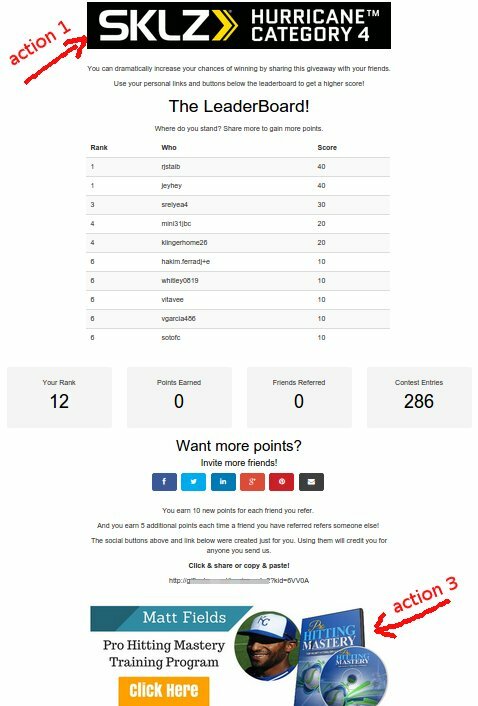 When they have one of their friends subscribe through their referral link, they earn 10 points. And when one of their friends refer someone else, they earn 5 points. It’s all done to motivate them to share with as many people as possible. 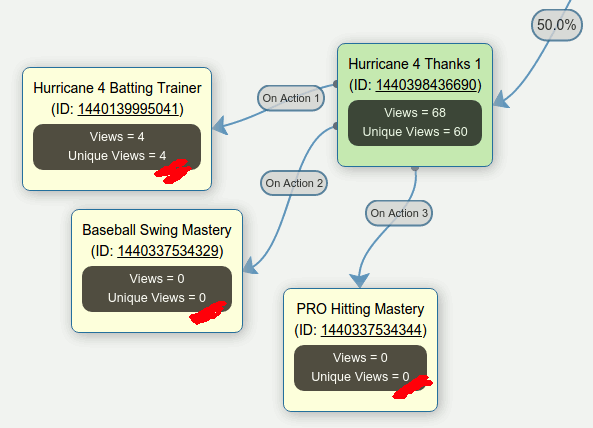 So I cut optin 3 from the split test to send all the traffic to optin 2 (the one with the video background). At this point, I should have added a new optin page to try to beat optin 2 but I didn’t. I was busy in another part of the funnel. I noticed that people reaching the thank you pages, barely clicked on the affiliate links. Instead of sending them to the leaderboard pages with the top and bottom banner, I split tested 3 new pages instead. I still kept the leaderboard pages. But instead of sending the leads to those pages after they optin, I sent them there in the welcome email they receive. That way, I could still explain to them that they can earn more points by sharing with their friends. 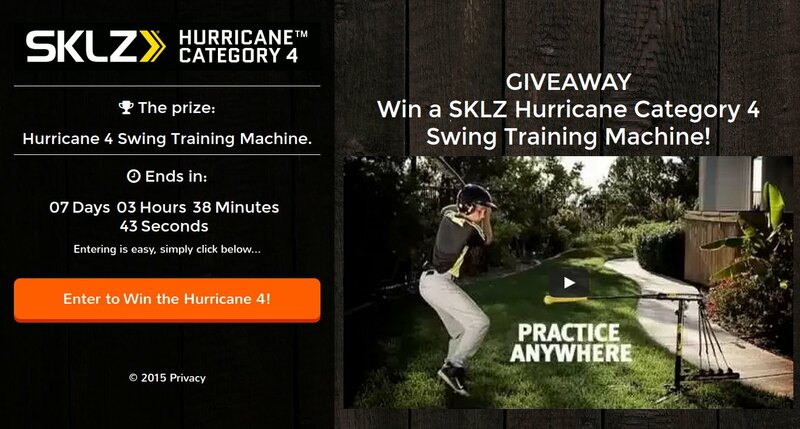 Subject -> Hurricane 4 Giveaway: Increase Your Chances of Winning! Thanks for your interest! Your entry is now confirmed. 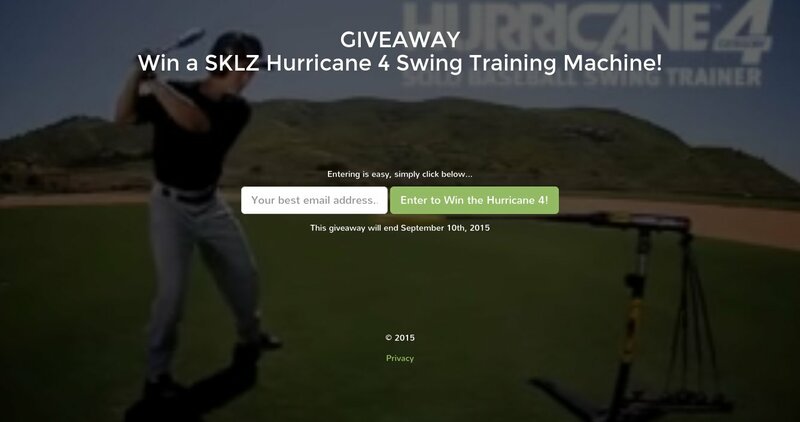 BUT are you THE one who is going to get the Hurricane Category 4 Solo Swing Trainer? You currently have 1 point. You earn 10 new points for each friend you refer. And you earn 5 additional points each time a friend you have referred refers someone else! These links were created just for you. Using them will credit you for anyone you send us. 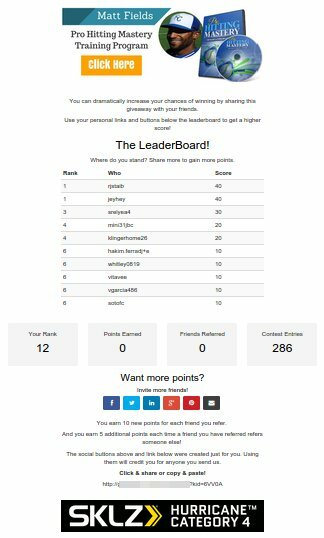 You can check the leaderboard and your current score at any time by clicking **this link**. PS: The winner will be selected based on a weighted draw. Everyone has a chance to win, but the more points you earn, the more chances you have.